A spacious quad located in an exclusive development with a Communal Pool 50m away. IDEAL FOR GOLFERS. (5 Championship Courses . Everything can be arranged e.g Transport, Green Fees & can include in local English Speaking Golf Society)The property has air conditioning (Pay as you use electric meter)and satellite TV. It is within walking distance of beach(+bar & Restaurant/SportHire/Boating/Fishing/Banana Boat/Peddle Boat/Rib Hire), Shops & 'Strip',Bus. Electric Gates. Safe. 5 Superb golf courses accessable 'Golf'. Alicante airport 40 minutes/ Murcia airport appx 15 min. The house comprises 3 bedrooms, bathroom, a separate shower room and toilet, a living/ dining area with well fitted galley kitchen & Patio.Beautifully tiled throughout & marble staircase. There is a large roof solarium (Use to dine/sunbathe/look at the sea) as well as shaded areas in the garden. Try Campamore or La Zenia beach too!! A visit to Torrevieja is a must for shopping and night-life, amusement arcade, waterpark and romantic stroll by the sea! Further information re endless attractions available.A friendly complex mostly owner occupied + Private Off Street Parking. Brief Description of the Area: The nearby town of Torrevieja is 28 miles south of Alicante on the Costa Blanca (10 min from Cabo Roig), with its fine sandy beaches. The area boasts of 300 days of sunshine per year. Torrevieja is a typical Spanish town with an expanding harbour and marina. Torrevieja caters for all tastes, with bars, restaurants, an Aqua/Water park, 10 pin bowling, go-cart tracks whilst the Cabo Roig urbanisation is quieter with Indian, Chinese, Japanese, Mexican, Italian, Japanese, Belgian, German and of course the famous Spanish Restaurants. It also has some of the best Pubs in the area. Take a trip to Tabarca on a glass bottomed boat for a great day out. (Please contact us for our website address) Paste the link in your browser for a look. Near Benidorm, there are three large theme parks situated: Terra Mitica, Mundomar and Aqualandia. It takes about an hour and a half driving to get there. All are well worth a visit. Visit 5 DAILY local Markets,Visit Guadalest Mountain Region for stunning views . The climate : This area of Spain has average temperatures of 20 degrees C, higher in Summer. It boasts a minimum of 300 sunny days a year and has been described by the World Health Organisation as among the healthiest climates in the world. The MAR MENOR is the largest salt water lake in Europe . It's calm shallow warm waters are rich in iodine and salt making it highly invigorating with imense therapeutic value. The Mar Menor shares the same microclimate with Torrevieja and benificial health properties. It has the warmest winters in Spain and was recently declared to have the cleanest air in Europe by the World Health Organisation. Salt Flats with 2x Lagoons are famous for having 250 bird species. LOCAL BLUE FLAG BEACHES: Cabo Roig's Cale Caleta & Cale Capatain both magnificient beaches with clean water having sand cleaned daily.Restaurant facilities & loo's available. Plus volleyball and water sport activities. Others include LA MATA,LA ZENIA, PLAYA FLAMENCA,LOS LOCOS,EL CURA & LO FERRIS BEACHES. I am a Mother of 3, the youngest 14 and I work very hard as a Nurse for my family. I love having guests and encourage people to relax and enjoy. I do my best to keep our holiday home up to date and provide as many facilities as I can. It is stressfull dealing with Holiday Letting companies and it all demands alot of my time. Most people are fantastic and there is never a problem. I always hope my guests are normal everyday people hoping to enjoy their holiday . This Private Complex is mostly owner occupied and thus well maintained. It is within a gated community and has private off street parking. The villa is 50-60M from the swimming pool. It is a Quad i.e each block has 4 adjoining houses. The main feature of this area is the fabulous all year weather and the huge choice of clean sandy beaches and clear sparkelling sea water. 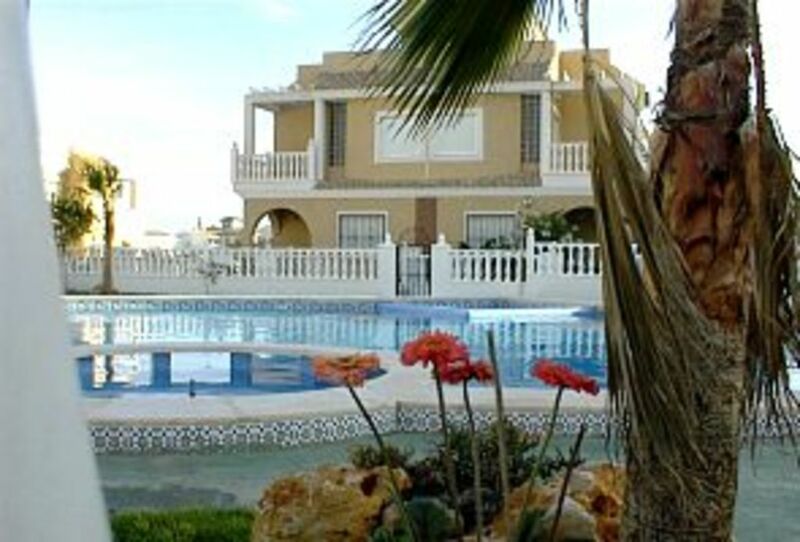 It is within walking distance of Cabo Roig Strip (i.e. The Social hub of the area which got the name strip due to being rows of pubs, restaurants and businesses running up both sides of the 332 road) and all ameneties such as restaurants, bars, supermarket, pharmacy, banks etc A footbridge links both sides of the strip over the 332 road. Ideal for Golf enthusiast's and groups due to boasting some of the best courses in Spain. Let me know if you wish to join the local golf groups and arrangements can be made for a great golf week away. toilet, combination tub/shower, shower, bidet, Outdoor showers at pool for post sand. Bathrooms are fully tiled; floor to ceiling and main one very spacious, airy and bright and easy to keep clean during your stay. Clothes dry very quickly on the solarium clothes line. It is best to take your garbage regularly to the local bins situated outside the electric gates to right or left (HELPS DISCOURAGE ANTS AND SPANISH MIDGES). Please do not flush more than normal and paper down the loos. In Spain CONSERVATION OF WATER is uppermost in peoples mind so remember to turn off taps, use the plug for washup and quick showers! SMALL SAFE FOR VALUABLES FOR YOUR USE. My title "Great Villa" says it all. My wife , 2 daughters and myself arrived in Alicante at 10 pm . We were delighted to see our names on a placard by our prearranged driver. We were informed by John on the short trip down the coast of the various attractions in store for us in Capa Roig . We were met at the gates to the villa by Maire,s very efficent rep who had a complementary glass of wine for us . After a good sleep we took time to explore our villa and its surrounds . We were most impressed with the attention to detail throughout the villa from cleanliness to its general decor and facilities. From dining alfresco in the barbecue area to the excellent kitchen . With excellent facilities for taking the sun in the courtyard and the solarium, to the fabulous pool and sky TV, it was perfect. So top compliments to Marie and her team for an excellent experience .D&D. Many thank's ! Another satisfied customer is very pleasing to our team indeed...hurry back! Cabo Roig is South of Torrevieja in the direction of San Pedro and Cartegena. It is situated between La Zenia and Campoamor.From Alicante airport take the Murcia route on the Auto Via/motorway and exit at the La Zenia junction. Once you come off the motorway it is only 10 mins. to the house. Or, from Murcia take the motorway in the direction of Alicante and take the same exit. If required ,collection from the airport can be arranged (payable locally) Walk to restaurants, pubs, shops etc ..'The Strip' has all these ameneties including pharmacy, beauty/hair, internet/phone, safe deposit box, travel agent, toutist Info, bakery, church, bus stop, banks, takeaway food, medical clinic (English speaking). Walk to beach (Blue Flag with Beach Bar/Restaurant). Golf: What can one say 'GOLFERS PARADISE' is what springs to mind. Great weather all year round, championship courses, six in all nearby. The best 19th holes in Spain and no early closing !!. Good restaurants to wine and dine in while discussing the next 'Birdie' or 'Hazard'. Below are some courses and approx fees. Facilities: Changing rooms, lockers, parking, pro shop, lessons, clubs, driving range, buggies and a restaurant are available. Unless stated otherwise, all courses are subject to handicap restrictions of 28/36. NA = No handicap restriction. Soft spikes required at all courses. Ski: It is possible to Ski (Believe it or not) at Sierra Nevada but it is a 4 hour drive. We have done this in winter and stayed over to visit Grenada and all it has to offer. Just google it for information. The children swam in the sea in November wearing wetsuits whilst we sat in the sun reading the newspapers! All depends on how adventurous you are.